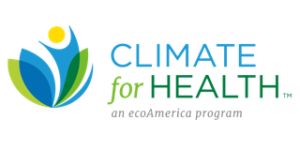 ANHE is a founding partner of Climate for Health, a national initiative that brings together leaders and institutions across the health sector committed to advancing climate solutions to protect the health and well-being of Americans. Climate for Health helps inform the American public about the health risks posed by a changing climate and clarifying the connection between their own health and the health our of environment. This nationwide network of nursing organizations will be instrumental to move the profession forward in addressing climate change. The main goals of the Collaborative work are to elevate climate as a visible health priority, create a climate literate nursing community, engage all stakeholders in connecting climate and health, and to build collective support and action for solutions.